A floor and part of a wall thought to date back to the English Civil War have been uncovered during conservation work at Pontefract Castle. The discovery was made as work began on a £3.5m project designed to open up the Castle’s Sally Port for the first time since 1649 and provide a new café, gift shop and museum for the visiting public. Pontefract Castle has been part of the ancient Duchy of Lancaster inheritance since 1311 and has a long and colourful history. Thought to have been the site of Richard II’s incarceration and death from starvation in 1400, it formed part of Henry VIII’s Royal Progress of the North in 1541 and was immortalised by Shakespeare as ‘bloody Pomfret’ in Richard III. 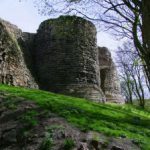 It was once one of the most important fortresses in England, a long-standing Lancastrian stronghold and the last Royal Castle to fall to the Parliamentarians during the English Civil War. While still owned by the Duchy of Lancaster, today Pontefract Castle is an Ancient Scheduled Monument under the care and management of Wakefield Council and Historic England. 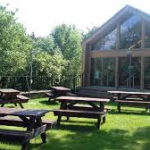 The ‘Key To The North’ project funded by Heritage Lottery Fund, Historic England, Wakefield Council, The Wolfson Foundation and landfill charity EPaC began in September 2015 and is expected to be completed by the end of this year. Pontefract Castle withstood three separate sieges over a three-year period during the Civil War, no doubt making good use of the ‘Sally Port’ which is a controlled entryway to a fort or prison used as an emergency exit in times of trouble. When completed at the end of this year, visitors will be able to enter the Sally Port for the first time in over 350 years and view the new archaeological discoveries for themselves. The new £3 million visitor centre opened to the public in July 2017 and attracted almost 2,000 visitors in the first four days of opening. 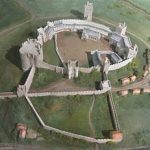 For more information on Pontefract Castle and the Key To The North conservation project, please visit www.pontefractcastle.com.